The unfortunate news of the week was that Chic Name had a setback, which ruled him out of the Cross Country Chase at Cheltenham on Friday unfortunately. This race had been the aim since his run at the Festival in March, so it’s obviously a big disappointment, but that’s racing for you. It also rules him out of the Becher Chase at Aintree, where he held an entry alongside Allysson Monterg. The latter named is all set to go to the Ladbrokes Trophy. We’ve had the rain we were hoping for and although he hasn’t had a prep run, he’s as fit as we can get him. It’s all up to him now. 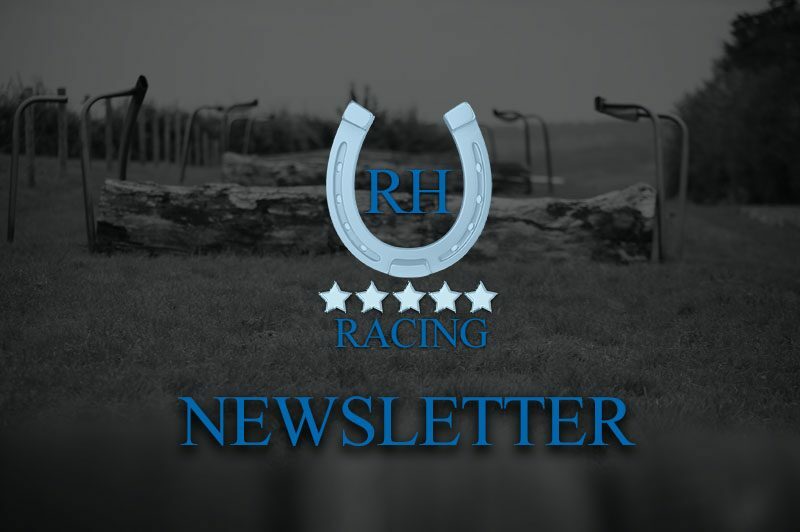 We’ve had five runners since our last newsletter, starting with Eureu du Boulay who ran well on chase debut over at Hereford. It was a hot race with a few decent chasing prospects in there, including former RH horse Going Gold. Eureu jumped well under Jamie Bargary, travelling in the middle of the pack in the early stages and was still in with a chance coming to the penultimate fence, where we were squeezed up against the rail by a poor jump from Jurby. That killed any momentum and although Eureu ran on again, he could only finish fourth. Despite that, it was a decent enough start from out of the handicap and we hope he can come on from the experience. Lord Du Mesnil reverted to hurdles after a fall and an unseat over fences. He took an early lead with Alain Cawley in the plate and jumped his hurdles well. As things hotted up at the front, he couldn’t quite go with the front two but wasn’t unduly punished once his chances of victory were over. The hope is that a nice clean round over hurdles will have done his confidence a load of good and he shaped well enough to suggest that he has a race in him at some point this season. Valadom ran a great race in a competitive hurdles event at Cheltenham to finish fourth under Tom Broughton. He was nicely settled, especially in the early stages when there were a few horses playing up at the start, he behaved like an old seasoned pro. He raced in the middle of the pack for most of the way, making headway down the side of the course and staying on nicely for fourth place to claim a bit of prize money. Echo Watt could only manage 8th against some more hardened handicappers, in conditions that probably didn’t suit him as much as the others. He’s still young though and a bit more rain will certainly help his cause next time out. Filipine was more settled this time around but stumbled and fell about nine furlongs out in her bumper appearance at Warwick. Luckily, neither her nor Tom Broughton were much the worse for the fall and she goes again this week. A few entries this week, starting with Filipine on Thursday heading to Warwick to make up for her unfortunate stumble last time out to run in a bumper under Alain Cawley. Hopefully, she can get around without incident and carry on the improvement from last time. A few horses have multiple entries, starting with Discko Des Plages who is entered at both Newbury on Friday and Doncaster on Saturday, but the intention is to go to Newbury for his hurdles debut under James Bowen. It’s a decent enough maiden over two miles, as you’d expect at Newbury, but hopefully, he can improve from his two bumper runs back in the spring. He’s in a similar race at Doncaster, perhaps slightly weaker, but the preference is for Newbury. Eureu du Boulay also has two entries, one at Doncaster on Saturday and one at Southwell on Tuesday. Both are novice handicaps, although the Doncaster race is over two mile four while the Southwell race is over just two miles. We’re not quite sure where we’ll go yet, but he’s a good jumper who should make a chaser and hopefully, there are no horses interfering with us this time. Allysson Monterg is all set for the big one at Newbury, the Ladbrokes Trophy, although he also holds an entry in the Rehearsal Chase at Newcastle. He’s in great order at home and although we would’ve liked to have got a prep run into him, he’s as fit as we can get him. The weather has prevented much in the way of prep runs, but he’s had a couple of racecourse gallops, including last week at the track and the rain has come to help ease the going for him. He’s a proper galloper, who shouldn’t have an issue with the trip and if he can jump as he did at Perth last time out, he could outrun his odds. Lord Du Mesnil is entered at Newcastle as well, in a novices’ hurdle over two miles six. He ran well for a long way back over hurdles last time out and this is another opportunity in that sphere. He’s also entered up at Haydock during the week, so it remains to be seen which of those entries he takes up. Both courses will have had plenty of rain, which will be fine for him, so the weather at least is starting to work with us. The last one, also at Newcastle, is Extra Bald who goes novice hurdling for the first time. He’s entered in a two-mile race and will be very well suited by the soft conditions currently at Newcastle. We’re looking forward to seeing him out jumping in public.